How’s this for an opener: The Reds’ starting rotation is worse than the University of Florida’s, the Reds’ bullpen is better than the one currently at the top of the AL Central standings, and Thom Brennaman is a schoolyard bully. Looks like a three-pitch strikeout of a sentence to me, so let’s break this down a la Rob “Pitching Ninja” Friedman. Strike 1:Ã‚Â The Reds’ starting rotation has the worst WAR of any staff in the league BY NEARLY TWO WHOLE POINTS. Led by Homer Bailey’s abysmal -1.2 WAR, the Reds staff’s -5.4 mark looks longingly up at the Padres -3.7, hoping for better days. And it’s not just Homer being an anchor on otherwise productive young guys. The starters minus Homer and Brandon Finnegan have a -3.5 WAR, which hey, better than the Padres? Indians’ bullpen: -3.5 WAR, which hey, better than the Padres’ rotation? Strike 3:Ã‚Â Okay this is the one that gets me, and albeit, it is a week’s old taunt now, but Thom claiming the Rays are “an awful organization” and mocking them for starting Sergio Romo is pretty rich when you work for the Reds. Steve Mancuso wrote much more eloquently about the incident when it happened, but I just can’t wrap my head around the reasoning on Brennaman’s part. Why pick on the team trying when your team can barely figure out the difference between the bullpen and the DL? Have you figured out where this post is going yet? 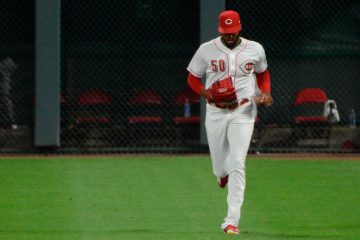 That’s right, the Reds should use Amir Garrett and Raisel Iglesias as openers, just like the Rays have used Romo, in order to get their best pitchers more innings, cushion the load on the young developing guys, and just stop being the backwards-thinking organization it has been for, well, ever. There’s a video out there that if you’ve ever been to a leadership seminar, I’m sure you’ve seen it already. It shows a shirtless man dancing, or really moving his limbs, at the Sasquatch music festival in 2009. Gradually, more and more people join in on the dance, until the whole dang festival is shaking their limbs off beat with this shirtless man. Accompanying the video are some lessons on leadership, the most important of which deals with the idea of the first follower. While there is a leader, the shirtless dancing man or perhaps the Tampa Bay Rays, he can easily be dismissed as a lone nut and ridiculed (ahem, Thom). The more important player is the first follower, who joins the leader and shows everyone else that maybe the leader is on to something. What do the Reds have to lose by being the first follower? Just yesterday, Tyler Mahle labored through 5.0 innings with 96 pitches. The start before that? 5.0 innings and 102 pitches. And ditto, 5.0 and 102, for the start before that. Mahle’s not getting lit up in these starts either, allowing seven runs across the 15.0 innings. It’s not a good line, but he’s not pitching poorly, just inefficiently. Now imagine if Mahle could game into the game in the second or third inning and face the bottom of the lineup to start. Imagine if he didn’t have to battle right out of the gate, running up his pitch count. Imagine if he could learn how to work into the third time around the order, but ease his way to working around the top of the order a third time. All it would take is moving Amir Garrett back into the rotation, an idea I don’t think many will push against. Garrett has been the second most valuable pitcher for the Reds this year, behind only Jared Hughes, but has only thrown 34.2 innings. If the Reds adopted a system where Garrett started in front of Mahle and Iglesias went in front of Romano, then two of the Reds top three pitchers would be maximizing their innings and, for Iglesias at least, their trade value. Should a close game still need to be closed, shutdown reliever extraordinaire Jared Hughes would be ready to go. To be fair, this entire experiment would require player buy-in to even get off the ground. Just pushing these new roles on players seems to always be poorly received (ahem, Homer). But if the front office and Jim Riggleman are committed to these young guys being the future of the rotation, then something needs to be done to get them up to Major League speed. When the young starters prove they can take the mound without training wheels, then they begin the game all by themselves again. But for the time being, why continue to let flounder when there is a better way to acclimate to the Majors while maximizing existing value? So how’s this for a closer: The Rays are dancing alone at the moment and Thom can mock them all he wants, but pretending to be a cool kid from the cellar of the NL Central is so overrated. The idea is definitely worth further consideration. Wesley, the merits of the idea you laid out are intriguing. Problem with this is idea that you are putting your good relievers in low leverage situations. Not sure you want your middling/bad relievers coming in high leverage situations. Yeah, Romo is actually one of the worst Rays relievers, he just has really good splits vs righties. I do like the idea a lot, but burning Garret or Iglesias for one or even two innings to start doesn’t make sense. I wouldn’t mind using someone like Brice in this kind of situation. Good point, especially considering how many runs the Reds are giving up in the first inning this year. You’re kind of right. The game starts off in a middle leverage situation but there are more low leverage situations in the first inning than in any other inning in the game. The main problem in my opinion is that you are wasting your high leverage guys in middle/low leverage situations and they won’t be available later in the game if a high leverage situation comes up. Note this is different than saving your best reliever for save situations because high leverage situations occur more frequently than save situations. Of course when you are already down 2 or 3 runs you never get to high leverage situations in half your games, because the game is already out of hand. Actually it’s as high leverage as it gets to start the game when it is tied 0-0. Any tie game or game while the lead or deficit is a single run is a high leverage situation – the highest it will ever be. And the topper – using your best pitchers versus the best hitters of the lineup. That’s high leverage. Nope, the Leverage Index is .9 at the start of a game which is considered a medium leverage situation. The Leverage Index simply measures changes in win probability depending on a specific situation. Batters have no bearing in determining the leverage Index. The situation does. Giving up a lead in the first inning does not effect your chances of winning as much as giving up a lead in the 8th inning does. I understand what you’re saying there, but there is an underlying assumption that you get to the tie score later in the ballgame while still having your best arms in reserve ready for deployment without having used them up earlier. More math taking out those assumptions is necessary. What is the probability of getting to the 8th inning tied (let alone having a lead) when (1) using one of your best ‘short’ arms for the first couple innings, followed by a ‘starter’ length arm pitching to the bottom of the lineup and hopefully another 5 or 6 innings….. versus (2) using your ‘starter’ length arm the first 5, 6 , 7 innings followed by your ‘short’ relief arms? Reds chances of having a lead or being in a tie ballgame by the 7th or 8th innings I conjecture is much greater following (1) than following the ‘normal’ model (2). That’s probably true for most clubs, the exceptions being Houston, Cleveland. Maybe there are others I can’t think of now. You’re the one making assumptions. The leverage Index contains no assumptions. It’s a summation of the statistical analysis of changes in specific situations on win probability. A tie game is only one of many different scenarios contained in the leverage index so I ‘m not sure why you are so fixated on tie games. Wesley, the Red’s front office doesn’t do thinking outside the box. When I become principal owner of the Reds I will maintain the tradition of nepotism established by my predecessor. All my family members noted below, if they accept a position, will earn large bonuses based on the winning record of the team. If we have a losing record they will be paid in headless bobbleheads or bobbles without a head. In addition, Bobbleheads will be banned from the GABP! My cousin Steve Manusco will become Sr VP and GM because he has demonstrated a keen insight on how to improve a roster. One of his first things for him to do is to hire a new manager. I will leave it up to him. Second, he will begin making bold moves to improve the roster; he knows what needs to be done. The Cossack, my grandmother’s grand-nephew will become VP and Assistant GM, he also has a keen insight on how to build major league rosters. Chad Dotson, 2nd cousin on my Mother’s side, will become, Sr VP of Operations. None of us will know what he does, but he’ll have a cool title. Jim Walker, Great Uncle on my fatherÃ¢â‚¬â„¢s side, will be VP, Organizational Pitching Coordinator because I like his insight on pitching. My Uncle Don will slide in next to Marty, because we need another crotchety, old-fart on the radio broadcasts. John Gray, my mother-in-lawÃ¢â‚¬â„¢s grand-nephew, will become VP, Minor League Coordinator. His talents are well known and welcome. Wesley Jenkins, my daughterÃ¢â‚¬â„¢s husbandÃ¢â‚¬â„¢s cousin will be VP of Outside-The-Box-Thinking. Something the organization really needs. The front office will have one guiding principle: Ã¢â‚¬Å“De l’audace, encore de l’audace, et toujours de l’audace!Ã¢â‚¬Â There will be no excuses for failure. As the owner, do you promise not to let the word small market be a crutch to lean on?? Will you open the pocket book and spend some cabbage? Your family won’t let you blow money on stupid washed up veteran players. If funds become tight, you could always release Dotson. Doofus, I think we may be distant relatives. Please appointment me head of the analytics department. I promise not to recommend to the manager Steve hires to have the fastest guy lead off. Please send your DNA test to our Sr VP of Ops, we have to give him something to do. A resume is not necessary. I’m confident that we can have you fill the position you seek. After all, you spelled ‘analytics’ correctly. But, hard pass on Iglesias doing anything other than being used towards ends of games. The Reds desperately need him moved by Winter Meetings, at the latest, to get an influx of MLB-ready talent. And, he is best showcased, by far, as a multi-inning closer. Take it a step further. Let Amir go until he gets in trouble which is usually his 3rd inning, so start him, have Tyler warming up when Amir starts his 2nd inning and then if he gets through 3, Tyler does his 5 and Iglesias does the final inning. At this point, anything is worth a try. Also, what would hurt at looking at Lorezen as a CF. Remember Rick Ankiel? Great first year. Then couldn’t find the plate. Not as athletic as Lorenzen. If Lorenzen cab work up quickly, he is available to pitch. Also, could help by not carrying 13 pitchers. Besides, how much worse can his offense be then Billy. Only thing is Billy has a nicer smile now. Looks real good on the way back to the dugout with the bat in hand. One last thing, Thom did it again my announcing the passing of Red Schoendist. He announced like 15 middle names when discussing him. The Old Cossack had missed multiple games of listening to Thom, so the game yesterday felt like a dousing if ice water on a cool morning. Thom’s bravado and buffoonery, his phony self-deprecation and incessant repetitiveness are simply boring and grossly unprofessional. Knowing that was going to be the only game I could watch for the next 2 weeks made it even worse. Personally I would rather watch the dancing guy than the Reds. That dude is unstoppable! What the Rays are doing reminds me of something the Astros were doing during their rebuild process. Not exactly the same but out side the box thinking with young pitchers. I remember an interview with someone in the front office about how they were developing pitching in the farm system. The response was “We have a lot of arms so we are pairing guys up to both be on the same starters rotation.” The idea was the pitchers will start or relieve their partner every other outing with the starter that day getting 5 innings or pitch limit. Eventually the competition would lead to who the starters and who the relievers were. It would be nice to see the Reds try anything at this point. The reason more runs are scored in the first inning is that it’s the only one that **every game** has the best hitters batting. Managers (local team notwithstanding) put three of their best hitters at the top of the order. The first inning has lower leverage situations only by definition because the definition of leverage is built to emphasize later innings. But think about it this way – the top of the first inning is always a tied score. The bottom of the first often is tied. II bet it has the second-most ties of half-innings. So if the closeness of the game is paramount in determining leverage, and it should be, you can’t beat the first inning. In terms of saving the best pitchers – tie-breaking runs are tie-breaking runs, whenever they occur. And runs are runs, obviously. Putting in a relief pitcher to face the first three batters makes sense. It doesn’t have to be the best reliever. Sergio Romo was nowhere near the best reliever on the Rays. But it does have to be one who can match up with the best of the other team and not get blown out. The Reds have several relievers who meet that criteria. Even David Hernandez would do. This is an intriguing idea for the Reds. They have a lot of starters who might benefit from this treatment. You wouldn’t want to do it for the guys who are great starters or close to it. But that doesn’t define many pitchers on the Reds. I’m not so sure you are correct about Leverage Index being lower in the first inning just because of definition. Leverage index is the measure of the change in win probabilities for each situation in the game. It just so happens that the based upon past data, situations in the first inning do not effect win probability as much as they do in later innings. Steve is absolutely correct….the ‘leverage index’ is lower in earlier innings by definition. If you play 12 inning games, anything that happens to break a tie in the 12th inning will more likely impact the final outcome than what happens in the 11th, which has more potential impact on the final outcome if a lead change occurs in the 11th versus the 10th, etc etc. The index let alone the outcome of any game by definition eliminates the importance of anything that occurs prior to the last tie. Let’s worry about getting to a late game situation where our team has a lead, or is tied, or has the smallest deficit possible, first. This isn’t 2012 when the best arms on the Reds staff were starters. Iglesias is the Reds best arm, followed by the grouping including Castillo, Garrett, Mahle, Hernandez, Hughes, Lorenzen and Flovio. Hopefully Disco stays healthy and Finnegan regains his velocity to join that group. When Romano develops another pitch he can join them. Not sure why you insist on using absolutes when it appears you don’t quite grasp the topic you are arguing.The leverage Index isn’t lower in the early innings by just because of some arbitrary definition. People have analyzed the changes in each possible situation and the effects on win probability in order to create the index. This study incorporates the fact that the first inning is the only inning where the pitcher is guaranteed to face the best hitters yet, based on empirical evidence, anything that happens in the first inning is still less likely to result in a win than in any other inning which is why you shouldn’t be using your high leverage guys in the first inning. Also, the Leverage Index does not only deal with breaking ties as you seem to be caught up in, it deals with any situation +-4 runs. I’m not against the idea of starting a reliever in the first inning. I’m just pointing out that putting a high leverage guy in a middle/low leverage situation isn’t the best use of resources. It’s like batting Hamilton clean up or having him leading off. This year- the 6 th inning is the 2nd highest scoring inning. Lots of guys have trouble getting through that lineup a 3rd time. The reds have a deep bullpen and a good one. I’d like to see a plan for innings 6 and 7. Lorenzen used regularly as a 2 -3 inning guy who hits for himself and saves a pinch hitter/ double switch. He can also build innings to possibly transition to a starter at the all star break. Same for Garrett . Get him to 100 innings this year with 2-3 innings at a time and see if he can handle the work. Use Iglesias as the super stopper to protect a lead anytime after the 5 th inning when the game is on the line. Floro/ Hernandez/ Hughes are doing great. I still think there is a case to be made to have 12 pitchers who can go 40ish pitches and not have roles at all. So no designated starters and no guys feeling they have to go 6+ innings and no guys caring about saves. Sounds like a good role for Homer too. Bingo, He can be a “starter” but just on a really short leash. Except Homer’s ERA is over 9 in the first inning…. I like the thought and it might look good on paper, but once implemented it might get sideways in a hurry. This is the Reds front office we are talking about that would be in charge of this. Approach with caution. It could be used up to the trade deadline though. The rubber should be hitting the road come August 1. Once the smoke clears from the trade deadline I would like to see the Reds get a little crazy on August 1. Start a rotation of DeSclafani, Castillo and Mahle #1 – #3. Then use Garrett, Lorenzen, and Stephenson for a 6 man rotation with the last 3 openly competing for 2019 rotation spots. Best 2 men win. Settle it on the field. If Garrett and / or Lorenzen show they cannot handle the load there it will be decided from that they are more of bullpen pieces and move accordingly. Innings shouldn’t be a concern for any of those 6. The schedule in August and September sets pretty decently for a 6 man rotation for those 2 months. August off days are on the 9th, 16th, and 27th. September off days are the 13th, 24th and 27th. Two off days in the last week of the season must be a scheduling anomaly and wouldn’t need the 6 man for that last week. The assumption is Harvey is traded by then. Bailey and Finnegan go to the pen, available to move up if one falters. It is past time to settle on a starting 5. If you can’t get 5 from this group of 8 then you’ll at least know to go outside the organization to find it. No more what ifs. This sorting of the starting pitching since beginning of spring training in 2017 has been like fumbling around in a pitch black dark room while tripping over the injured bodies. The Reds need to go into spring training 2019 with far fewer rotation questions than they have done so the last 3 springs. Hopefully the Reds front office will get rid of their circular firing squad and get things lined up right. Big unfortunate news for the LA Angels. Shohei Otani to the DL with a grade 2 UCL sprain and has already had PRP and stem cell injections. This isn’t looking for the Angels. The Reds could accelerate the sorting and offer up a young pitcher that is not currently in favor, Finnegan or Stephenson. Or maybe Matt Harvey to the rescue in LA. From NY to LA via Cincinnati. They also lost their closer to Tommy John. #1 prospect is CF and #2 is SS. Harvey would need to be paired with Scooter or Iglesias. Harvey needs to be better though as he is at best SP depth as a long reliever or spot starter at the #5 and he’s not even proven that yet. Interesting though and the Reds need to be bold. Hey now, you are talking too much sense here. Didn’t Cozart land with the Angels? The Reds speed would probably be to get him (i.e. his contract) back for Iggy’s. This is 100% genius and I find no holes in it whatsoever. (#Truth) Now Wesley, can you please figure out a way to improve Thom Brennaman? Let Brennaman announce just the first inning, then have someone replace him in the second and subsequent innings? Let’s face it, the Red’s have stunk for years,. The ONLY reason we have ever won any games is because we played the pathetic Pirates, Chicago, Houston, and Milwaukee. Unfortunately their management turned them into winners and the failing Red’s did nothing. I love watching the goofy Thom (normal people are Tom) Brennamin do the HVAC commercials. Very funny….He’s such an idiot. He must be desperate for money. I like the idea. It certainly makes a good amount of sense, especially with some of the starters we have. I’d probably like to see them save Iglesias for closing out games, but I definitely see Garrett and Lorenzen as great options for going 2-3 innings to start off games. Honestly if they didn’t throw more than 40-50 pitches an outing they could both do it twice a week (two games off in between “starts”). +5,000 for “start without training wheels” … that’s a great line. I just don’t know if it would be worth the flexibility you’d lose by reducing the number of guys you can choose from in the bullpen. I would probably want to backfill at least one of those relievers so that we’re not short on pitching options in late innings. Maybe try it in September when you have a ton of guys in the majors anyway? I can see it now. Its heating and cooling night at the ballpark. Thom gets to throw out the first pitch and throws a strike. He later says even he can throw strikes and then they hive him a bobble head night. Problem is his head is so big, it won’t fit in the box they come it.